What are the requierments to get a private pilot certificate? 4) 3hr of test prep 60 days prior to the final check-ride. 2) One solo cross country of at least 150NM total distance with full stop landings at a minimum of three points with one segment of the flight consisting of a straight-line distance of 50NM between the takeoff and landings locations. 3) Three takeoff and landings to a full stop at an airport with an operating control tower. Is there anything I need to do before I solo? The FAA requires you complete an application online to receive your student pilot certificate. This can be completed at https://iacra.faa.gov. You will need to register an account and submit your application. You and your instructor will then need to review and digitally sign your application together before you are able to submit it. An FAA 3rd class medical is required. We recommend making an appointment as soon as you begin flight training. The initial examination must be performed by an FAA approved medical examiner. Here is a list of the nearest Designated Medical examiners. The more often you fly, the faster you’ll earn your license. Also, flying frequently avoids having to review previously learned skills that become “rusty” through lack of practice. We recommend taking lessons at least 2-to-3 times per week until you solo and one lesson per week thereafter. What tests will I be required to pass? your airport as well as applicable portions of FAR part 61 (pilot certification) and 91 (general operating rules). B) Computer based written test – This test must be conducted at an approved testing center.Cape Girardeau is the closest location. This test is proctored and consists of 60 questions chosen randomly. You will be given 2 ½ hours to complete the test. Once completed you will be printed out the results and will be required to present the original printout during the final check ride. C) Check ride – This is the final exam and must be completed with a designated examiner. It consists of two parts, the oral and practical exams. The oral portion will be completed first. During the oral you will sit down with the examiner and he will ask you questions. This will last usually about 1 ½ hours. The second portion consists of the practical (flying portion) exam. During the practical the examiner will ask you to perform tasks that must be completed to ACS standards. This portion usually takes 1 ½ hours. We have a self-study course available that will help you to pass the computer based written exam as well as guide you through your flight training. 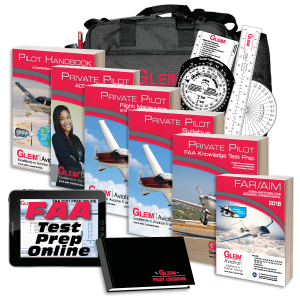 This kit contains everything you will need (except an airplane and CFI) to complete your training. At some point, you will need to pick up a current sectional (MAP) as well. These expire every 56 days and you will need this when you start your cross-country training as well as on your check ride. The cost of the kit is $174.95. Yes, we offer block time for our C-150 and C-172. Yes, financing is available through AOPA finance. For details see https://finance.aopa.org/flight-training-finance. How much will it cost me to get my private pilot certificate? The cost may vary based on how often you fly and how long it may take to become proficient enough to pass the final check ride with the examiner. The following are examples based on our 10 hour block time rates and the FAA minimum requirements. Keep in mind that most people need at least 55-60 hours in order be become proficient enough to pass the final check ride. Is there anything else I should know about learning to fly?